Ahh, let me repeat myself and express the woes of a modern miniature collector, “It’s so hard to find modern stuff!” This lack of available merchandise in the market has led me (and all my other fellow mod collectors) to get very creative. I have found some use in pieces designed for the popular children’s wooden dollhouse market. At first glance, these pieces look too clunky and childlike for modern collectors who typically like more realism reflected in the pieces they display. However, a closer look reveals a ton of potential. 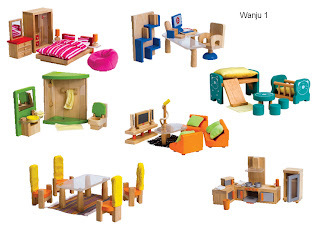 It’s this potential that has directed me into using a few pieces included in some kid-friendly wooden dollhouse sets. I take what’s useable and donate the rest to charity, daycare centers or sometimes I ship what I can’t use (don’t want to use) to nieces and nephews who are amused with and benefit from my toy interests. The Master Bedroom set has a great platform bed, complete with Perspex night tables. However, it’s the closet that has my greatest interest. The sliding acrylic doors are a beauty. I simply remove the pink/red drawers in the wardrobe to give it a more realistic look. Two to Three of these in a row look good in a mini modern bedroom or mudroom entrance. I’m not fond of the dresser or the beanbag. The Office set’s Perspex desk is nice. I also think the bookcase might work—looking a bit Ikea if left as is, but probably much better with some paint. The Bathroom set has a good sink and shower. Course, they both need to be hacked to get a more realistic look but they have good bones. The Living Room set has a useable coffee table and the TV stand would work nicely as a modern bench. Again, some paint on the bench might give it some “umph”. The Child Bedroom set only has the cat table and little chairs that I think would work well in a modern nursery. Everything else can go. The Dining Room set has a Perspex dining table that would work really well in modern settings. Again, The Master Bedroom closet is quite lovely. The platform bed and night tables are just okay. The Kitchen set is too chunky, though the sink could possibly work with some paint. The best piece is the shelving unit that sits on top of the sideboard. This shelving piece makes a nice headboard for a bedroom scene, complete with sliding acrylic panels and storage. The Living Room set’s greatest offerings are the two storage units. Nice left as is but paint can give them added glory. The Décor set has a very useable floor mirror and rugs. The clock works in a mod scene if you change the hands. In addition, the little picture looks good in a modern kid’s room or removed and posted on the fridge in your kitchen scene. The Bathroom set’s bathtub and sink are my favorites. The shower could also work with some paint and a change in hardware. The Dining Room set’s best piece is the sideboard (you can see it in the Malibu Beach pics), but I’ve found the table and the chairs work well for any modern décor—especially if you want to do a dining room that has an Asian modern flair. The Child Bedroom set’s bunkbed has great bones. The chunky cut works because it mirrors some of the modern designs of kid’s furniture coming out in the market today. The orange and red colors work great, but I’ve been thinking of painting mine chocolate or white to make it look more minimalist. Also, the storage set is good. Wow! I never would have thought to use any of these pieces. Thanks for the tip! 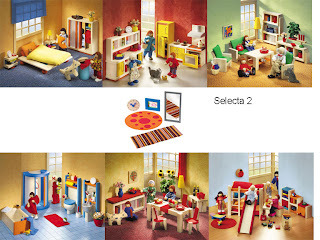 Under the 'Notable Others', you've mentioned the Ryan's Room Sets. Are these same as those available through Target.com? I came across these but I'm not sure if the scale would work. Are you familiar with these? Tks. Those are the same brand. Sometimes the scale is slightly smaller or larger than 1:12. It helps to take a piece of 1:12 furniture or a figure with you to the store to gauge if it will work in your scene. I have found that I will buy a set and can only use a few pieces. It's often trial and error.